And speaking of volcanoes... It seems like the Philippines will get a white Xmas of a different sort. Cnn reports the Philippines volcano Mayon is likely to erupt soon. Alert status has been raised to Level 4, which means "imminent". More than 222 tremors have been recorded in the past few days. One of the biggest volcanoes on Hawaii is active again. The HVO Kilauea Status Page gives all details, reports, images and (older) time lapse movies. :) Gorgeous. Reminds me much of Lanzarote! Last year around this time, we were all stunned by images from the tsunami that hit major parts of Asia. A year later, not much changed there are as efforts needed are enormous. However, forget tsunamis for christmas! What about a vulcano in your backyard for the holidays! The USGS Weekly Volcanic Activity Report lists vulcanoes that have erupted or showed other activitiy in the last week, month or whatever you pick. The list is impressive and recent eruptions are in populated areas of Mexico (gorgeous red sunsets there for some time to come! ), Guatamala and... Mount St Helens! Lots of Mother Nature's revenge this week! Earthquake in Kenia. Three vulcano eruptions with Mount Etna too. But the best one has to be lava waterfall at Kilauea in Hawaiï. 44 acres (roughly 10 hectare) slowly collapsed into the ocean. The rip broke open the wall of lava and fresh lava flowed into the sea from a height of 6 feet (1.8m) once more. It looks like NASA will prove to be right... It seems 2005 will prove to be the warmest year on record. Slashdot says: "2005 will probably have the highest mean global temperature of any year since the advent of systematic temperature records. At the moment, the mean temperature is about 0.75 degrees C above the global mean from 1950 to 1990, approximately .04 degrees higher than 1998, the year of the previous record." 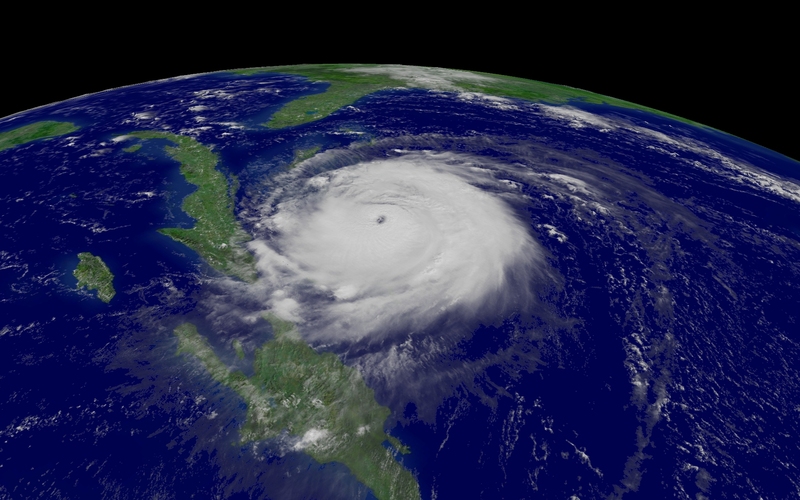 A hurricane is a frightening thing, but from space it looks very pretty. Pacific islands get these things regularly, so buildings and infrastructure and people are so what more prepared for them. Just like people in California are more used to dealing with minor and medium earthquakes, people on Hawaiï with vulcanoes and people in Bangladesh with floods. It's when nature wreaks havoc on ordinary modern cities that it does the most damage. Both materialistically as well as, and perhaps even more, psychologically. CNN reports that Mexico's Volcano of Fire (officially called "Colima") has errupted for the past two days. Ash has been shot upto 5km into the air. The lava has started some forrest fires. Some villages are being evacuated. "Officials called it the strongest eruption in decades at the volcano that straddles the line between Colima and Jalisco states, 690 kilometers (430 miles) west of Mexico City." Colima has erupted violently three times during the past 450 years. About 2,300 years ago, it produced a cataclysmic avalanche much larger than that of Mount St. Helens in 1980. But wait! There's more: a Sumatra volcano Mount Talang is rumbling now. 25,000 people have already fled the island. Smoke has only gotten upto 1000 meters in the air, so it's nothing major yet. But vulcanologists are at defcon5! It seems like mother nature has it in for Indonsia or something, because Earthquakes just keep happening there. There is a constant rumble going through the tectonic plates there. Also, probably as a reaction to all these shifts, Eastwards of this plate, near Hawaii, vulcanos are countering all the shifts of the plates.